In the wake of Mitch Lucker’s tragic death many have questioned the future of Suicide Silence. It appears they aren’t going anywhere just yet. In fact, they will be holding a memorial show in honor of their deceased friend on the 21st of this month at Fox Theater in Pomona, CA. That’s right, Mitch Lucker memorial show for the end of the world \m/ There will be a different vocalist performing every song and it promises to be a huge spectacle. Tickets go on sale at 10 am TODAY. If you want to go, get on that immediately because they will be sold out quickly. 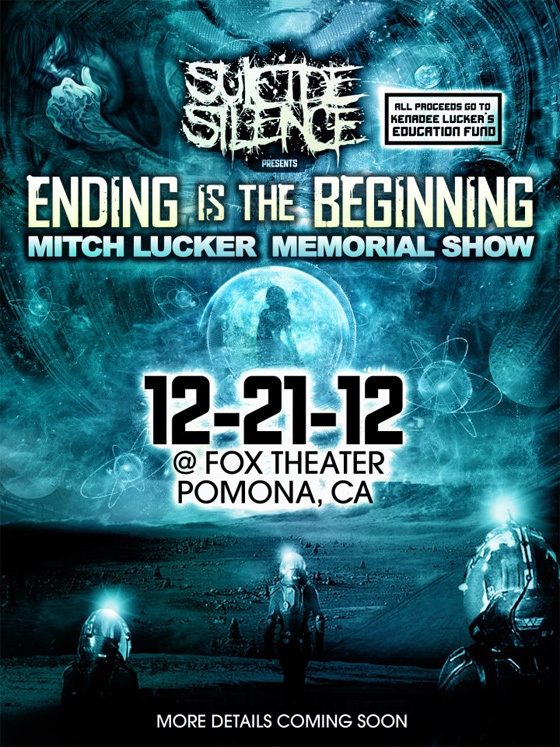 All profits will go to bolster the education fund for Mitch’s daughter, Kenadee Lucker. This is music for a good cause. Don’t miss out. « CHANGE OF LOYALTY SIGNS TO SUBLIMINAL GROOVE RECORDS!